Swift K11 is the advanced typical core alignment type fusion splicer for the medium & long range optical circuit LAN, CATV, FTTx with world-fastest in splicing & sleeve heating time. It delivers high precision performance with extremely low loss. For user’s convenience, LCD monitor has been designed with touch screen in addition to the operation keys. For user’s ergonomic preference, the screen can be turned around for one’s chosen viewing direction. While working in a manhole, the loader prevents the supplementary sleeve from falling and being contaminated. Working in aerial space such as telephone pole, the loader also prevents the supplementary sleeve from falling down. Detects the surrounding environment of temperature, humidity, air pressure and measure discharge calibration rate automatically. 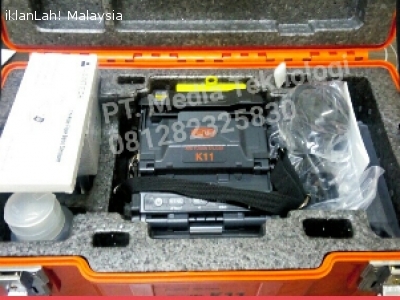 Kwalitas Produk / Brand No.Wahid Jaminan ORI, Menerima Repair Semua Type SPLICER & OTDR. Buktikan harga terbaik dari kami & nikmati kemudahan service after sales dari kami. Gratis ongkos kirim dan training untuk DKI Jakarta.